Happy Monday (which is actually a Tuesday...)! John and I spent this Labor Day weekend exploring the Southwest. We crammed a lot into the weekend, and got home late last night feeling tired... but a good tired - a fresh, outdoorsy tired (John's favorite kind of tired!). We started with a day trip to Las Vegas on Saturday. It was our first time in Las Vegas, and honestly, although we only spent a day there, I really can't see us going back. Everything we liked about it (i.e. pool, dining and shopping) is already available in Scottsdale. I don't want to be too hard on it since we were only there for a day (and some of the hotels really were beautiful! ), but I just don't think it is John's and my kind of thing (which is totally okay!). If you haven't been to Las Vegas, you might not realize that this picture was taken indoors! I swear, I knew I was inside, but the ceiling kept me thinking I was outside! No-go for selfies at the windy Hoover Dam! Bright and early on Sunday we headed to Zion National Park (along with 42,000 of our closest friends!)... the park was slammed!! I guess that's what you get on a holiday weekend. We started the day with a hike to Angel's Landing (which someone once said was so high that only an angel could land there). The hike is a series of switchbacks carved into the rock, with a precarious "climb" to the top. Chains are available in certain areas, and you best believe I took full advantage of them, considering the 1,000 foot drop offs on either side. The views were incredible and definitely worth the effort. After our hike, we went for the obligatory beer at Zion Canyon Brewery! On Monday we hiked the Narrows which is on many lists for top hikes in the world, and it 100% did not disappoint - in fact, I'm still obsessing over it - it was amazing! 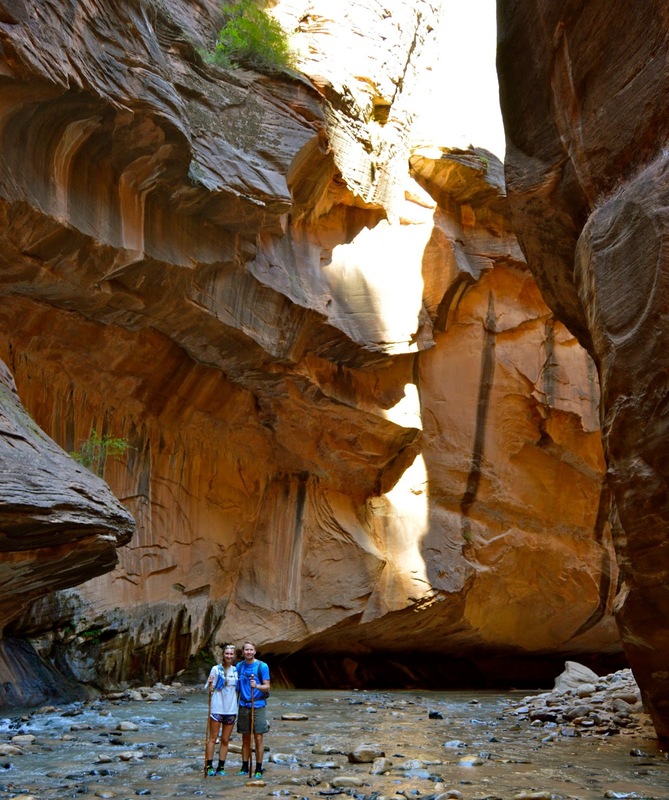 Basically, the Narrows are at the bottom of Zion Canyon (which was formed by the Virgin River), and the hike is basically through the canyon in the river itself. We had to wear boots designed for hiking in water with neoprene socks. The water was super clean and at some points, we were up to our waists wading through the river - it was a ton of fun! 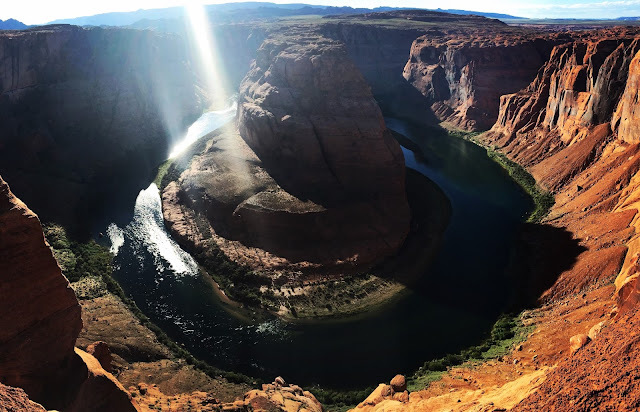 It was sad to leave Zion, but on our way back to Arizona we stopped at Horseshoe Bend, which is just north of the Grand Canyon. All in all, it was a pretty successful weekend and we were able to see a little bit of Nevada, Utah, and Arizona! I enjoyed the Hoover Dam more than Vegas too. I'm not much of a gambler and the hotels were pretty but that's about it. Zion is absolutely gorgeous! I've never been but my parents have been a few times and I definitely want to go some day! How beautiful! Maybe with views like that I would be actually be inclined to hike haha! I have no desire to go to Vegas either. 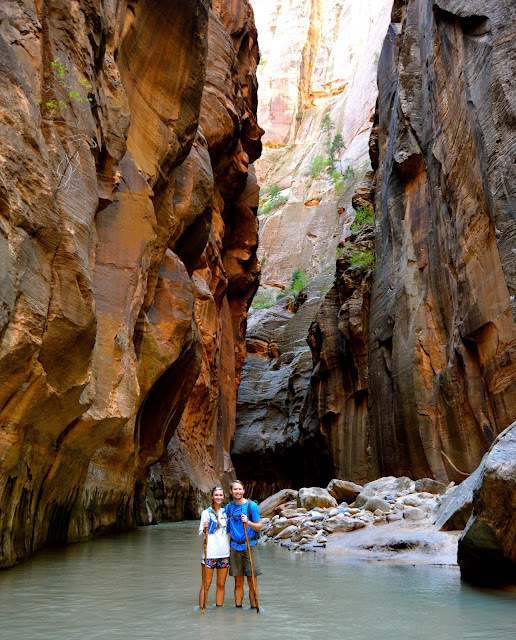 And I'm adding that Narrows hike to my bucket list!! That looks incredible!! I'm not so sure about the other one with my fear of heights. :) So glad you guys got to do some exploring over the long weekend! Hiking through the narrows looks amazing!! Wow these pictures are amazing!! I never knew places like that existed! I think Vegas would be neat to see but I don't think we'd like it either... my hubby did the whole Vegas, Hoover Dam, Lake Mead thing when he drove out to Cali one summer but who knows if I'll ever go and see it. The Hoover Dam looks neat! Lisa, I had to comment, you literally had the dreamiest dreamy weekend I could ever think of! How amazing to hike through the Narrows with your hubby and even to stop at Horseshoe Bend and Hoover Dam! I (imagine) I wouldn't be much for Las Vegas either, but I'm literally over here drooling at all of your amazing hiking adventures! Lucky girl! Looks like such an amazing trip! I have always wanted to see Las Vegas. I'm not much for gambling, but the sites and the experience are something I really want to try sometime! Plus, I love to hike, so some of these parks would be awesome for me. I am also not a fan of Vegas. I have been there several times for different occasions or events and I fall more and more out of love with it every time. It's expensive, packed and just not what I ever expected. Those hikes though, stunning!! This is the type of "outdoors-y" I love! Per usual, stunning photos. What an amazing time! What an amazing trip! I don't know how much i would enjoy Vegas but that view of "Venice" is so realistic! I love the hiking part though. Bucket list! OMG Zion looks amazing!! Those views... and the Narrows... I need to go there ASAP! Ryan & I aren't THAT outdoorsy, but this just seems like such a neat experience!! Wow! That looks amazing! I've always wanted to go there as well. Y'all have been to such cool places. Great photos! I especially love the one of you down below walking into the water. You look tiny! I've always wanted to go to Zion! What an amazing trip. I love zions! How far into the narrows did you go? Vegas isn't our scene either, but WOW, I would LOVE to visit Zion one day... because I've never seen anything like that!! Beautiful pictures, friend! !